Stringent EIAs enforcement = more regulatory muscle? 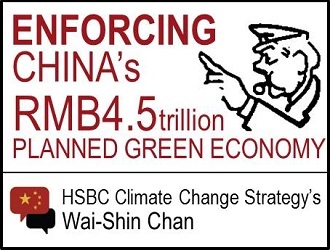 The State Council’s plan to grow China’s energy-saving and environmental protection industry by 15% a year – double the rate of projected annual GDP growth – is likely to increase the size of the market to RMB4.5 trillion (USD734bn) by 2015. This latest initiative weaves together the important themes of using less energy, cleaning up the polluted environment and promoting the seven strategic emerging industries (SEIs) which are being developed to support growth. If the target is met, energy-saving and environmental protection will become the largest SEI within two years. But in order to achieve the target of RMB4.5trn by 2015 – equivalent to 6-7% of GDP – the government will need to use all the tools at its disposal: fiscal incentives to stimulate demand for products and related services, the development of innovative technologies and regulatory enforcement. For us, the key issue is enforcement. The central government wants to demonstrate that it has the will to protect the environment and the initial signs look good. Beijing has signalled that it is going to beef up the Environmental Protection Law and the Law on the Prevention and Control of Atmospheric Pollution. Also, China’s 1010 environmental standards are due for a complete revision. Historically, the Ministry of Environmental Protection (MEP) has been a barrier to enforcement at local level. For example, after air pollution reached dangerous levels in parts of northern China in January, the MEP reported that it did not have sufficient manpower to perform accurate air quality assessments. In addition, it was acknowledged in the 12th Five year-plan (FYP) on Environmental Protection Standards that the MEP had a poor enforcement record. We think this is now beginning to change. For example, last month the MEP said it would stop approving new projects for PetroChina and Sinopec, China’s two largest oil producers and refiners, after they failed to meet pollution targets for two consecutive years. It’s a clear sign that the government recognises how important it is to give regulators more enforcement muscle. The 12th FYP for Environmental Regulatory Capacity Building has earmarked RMB40bn (USD6.5bn) to enhance environmental supervision and increase compliance with environmental laws. In future, companies will be subject to more stringent environmental impact assessments (EIAs) and will have to take out liability insurance to help clean up after incidents that cause pollution. Significantly, Beijing has made it clear that illegal acts will be severely punished. For China, expanding the efficiency and environmental sector is an important part of achieving the country’s long-term economic goals. Without giving much detail, the new plan urges both central and local authorities to promote energy saving products such as efficient boilers and LED lighting, as well as develop and expand the use of technology such as regenerative combustion and new-energy vehicles (especially battery components). In addition, energy saving standards for a number of products are to be revised, as are energy efficiency standards for new buildings. The government would like to see energy efficient products account for at least 50% of the market by 2015. The plan also identifies the three main areas that have already been subject to increased public scrutiny in 2013 – air, water and soil. For air pollution, monitoring and control are the main priorities, to be achieved by installing more monitoring equipment for PM2.5 (one of the key pollutants in January’s smog), and deploying more home-grown denitrification and desulphurization technologies in industry, as well as filters to control vehicle exhaust emissions. For water, the emphasis appears to be on “cure” rather than “prevention” – i.e. producing water by desalination rather than more efficient use of water. We think this highlights the mismatch between how much water is available in the country and how much the economy uses. Industry, one of the main causes of water pollution in China, is the main target for developing better waste-water treatment, such as membrane and sludge reduction technologies. A 12th FYP on soil remediation is expected soon and the State Council’s latest plan makes it clear that this is a very important issue, closely connected to food safety, particularly crops and vegetables. Significantly, the Chinese press has complained about the lack of disclosure about soil pollution. The government also plans to increase the funds available for investment in energy conservation and environmental protection, as well as offer incentives to accelerate the sector’s development. From a financial perspective, the green credit policy will be enhanced, more fiscal incentives such as tax breaks will be offered and, importantly, environmental companies will be encouraged to issue bonds. Stronger enforcement, coupled with increased investment and favourable policies are all likely to benefit companies operating in this rapidly expanding sector. Environmental Law Amendment: 40 Year Set Back?Will the proposed amendment set back China’s environmental development by forty years? Or will it be shelved? MEP Shamed 56 Companies for Polluting North China Plain with Seepage Wells MEP shames 56 companies in 5 provinces for polluting the North China Plain with seepage wells and pits with no anti-leakage protection.